Home Events Release Day at the Ucluelet Aquarium! 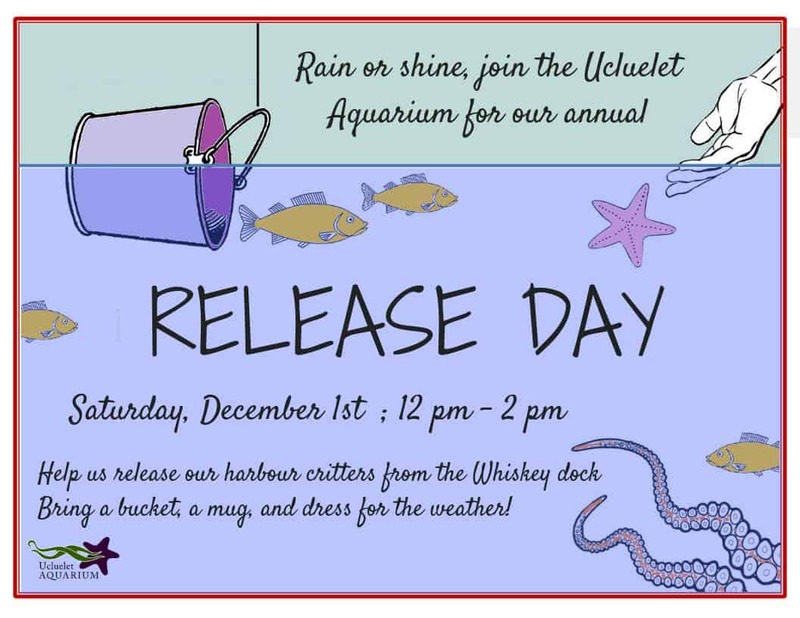 Join us for our annual release day at the Ucluelet Aquarium! The Ucluelet Aquarium is a catch-and-release aquarium so our animals are only with us temporarily. While most of the animals are released by our staff, we save some of our Ucluelet Harbour species for a public release day at the beginning of the month. We invite visitors and locals alike to come to the aquarium and help us release these animals off of the Whiskey Dock. If possible, bring a bucket – have limited aquarium buckets so the more the merrier. The release will happen rain or shine, so be sure to dress for the weather, whatever it may be! Also, bring a mug for hot chocolate 🙂 The release table will be set up at the entrance to the aquarium. This is a FREE event, though donations are welcome.